If I’m being honest, and I should be, I was so disappointed with how the Chinook and Cascade Engligh IPA turned out (even though my tasting panels showed it was a fine beer) that I completely ditched that recipe rather than tweak it into something I think is good. I hated that beer. Sometimes completely abandoning a beer recipe is good for the soul. I decided to return to a malt I use infrequently but in general LOVE, rye. I am going to do a few different rye beers before the year is out, this is the first of them. Moving back into a grain that I used to use but haven’t bothered with in a long time makes me a little cautious. I have some notes from 5 years ago when I used a lot of rye in my beers but I am too scared to start out with 20% rye in the grist bill. 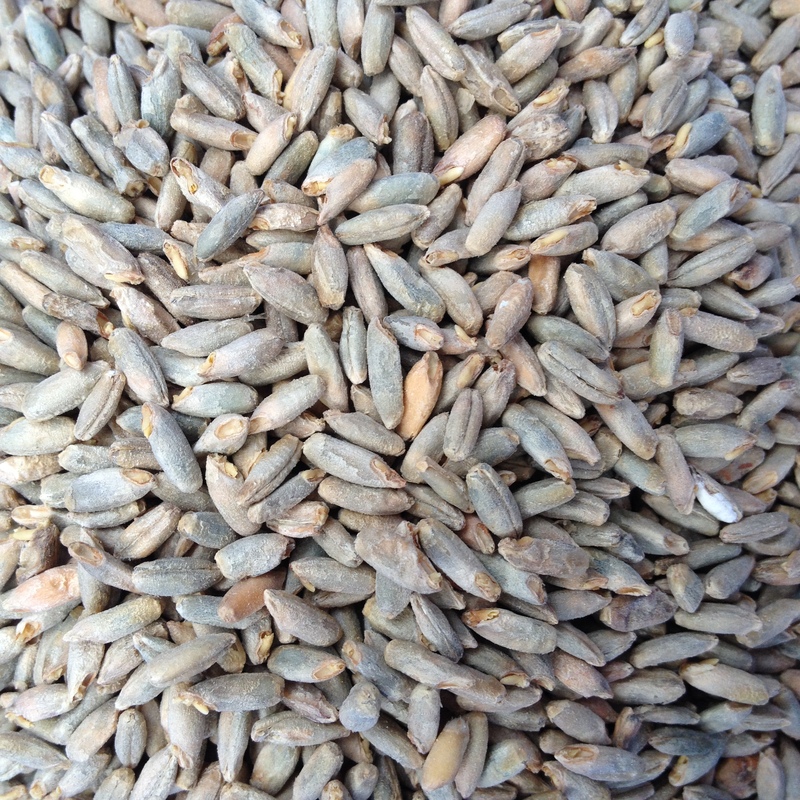 There are a few tips and trick when working with higher concentrations of rye that one can keep in mind when using it. I, of course, did none of these. This is due to the relatively low amount of rye I used in this recipe, when I bump it up to 10%, I might do some of these. Avoid other malts with high β-glucan – or do the rest or both. Don’t use a lot of unmodified malts in the same beer or a beer that has a lot of rye in it. Advice is just advice though, I’m a practical learner. I learn by doing. I will say that my notes from the 20% rye IPAs I used to make say ” β-glucan rest” in them..so I have done it in the past and will do it if this beer gets any higher in rye. The rye I’m using is malted (picture at the end of the post). You can tell because the “bottom” of the rye has broken open and some even have an exposed shoot. There are several different kinds of rye you can use in beer: whole, malted, rolled, and flaked to name a few. Each are different and yield a slightly different flavor or result. I’ve personally only used malted or flaked. Maybe better understanding what flavors come from the different forms of rye could be a long term goal of mine. Beer was mashed at 150° F for 60 minutes with about 4 gallons of tap water with a pH stabilizer added. After 60 minutes the wort was vorlaufed (it started out basically clear so that ended quickly) and drained into the brew kettle. After that, 5 gallons of water around 165° F was added, allowed to rest for a few minutes and then drained again. About 8.5-9 gallons was collected. Wort was brought to a boil quickly and held there for a total of 60 minutes. Whirlfloc was added with the 10 minute hop addition. A tablespoon of gypsum was added at the beginning of the boil. Despite this being my 10th brew day with this new burner, I missed my volume again by about half a gallon. Beer was left to dry hop longer than I wanted, a total of 2 weeks. That is really the outer limit of dry hopping if you are going to bother. I’d like to get the turnaround on these hoppy saisons down to about 3 weeks fermenter to keg. I’m close but life gets in the way. Blaugies yeast from Galaxy saison with Blaugies #2 (1/3 of the yeast cake). Fermentation started after 8 hours post pitching. I haven’t really noted this in any of my posts thus far but I’m writing up a series of posts on the microbiology of homebrewing and I want to point out that I did not “wash” this yeast going from these two batches. There are a few reasons why I didn’t bother but mostly because this was nearly 100% yeast cells and no “trub” material made it into the beer. These are also generally over-pitches (rather than underpitching), but I’ve started doing a lot more microbiology, calculating pitch rates and counting cells, for some upcoming posts. But this beer, just the lazy, pour the yeast in, treatment. My hop screen clogged on the side port of my pot, first time that happened…not sure why this time and not the other times, so I poured the entire ENTIRE contents of the pot into the fermenter. It appears I undershot my volume by a little, no worries. I forgot to take a hydrometer reading as well so I’m just guessing on the OG. This also means that I WILL be washing the yeast cake on this guy when it is done because I’m not giving up on this yeast because my port / screen got clogged. I put this in the kegorator and hooked up the CO2 so it would carb while I was away for a long weekend. I came back to an empty CO2 tank and two kegs of flat beer (Brown Saison was also on tap at the time). Due to my work and family situation, I didn’t replace the tank for 5 more days…THEN I carbed it up. Frustrating but unavoidable unfortunately. Well, this beer isn’t for everyone but I like it..a lot. I’m a much bigger fan of Chinook hops than most IPA drinkers. I definitely get into the fruitier hops and I’m not scared to brew with Simcoe, Amarillo, Citra, Mosaic or Galaxy…there is just something about a really earthy, sulfury, piny hop that I really enjoy. If that’s your bag this beer delivers. 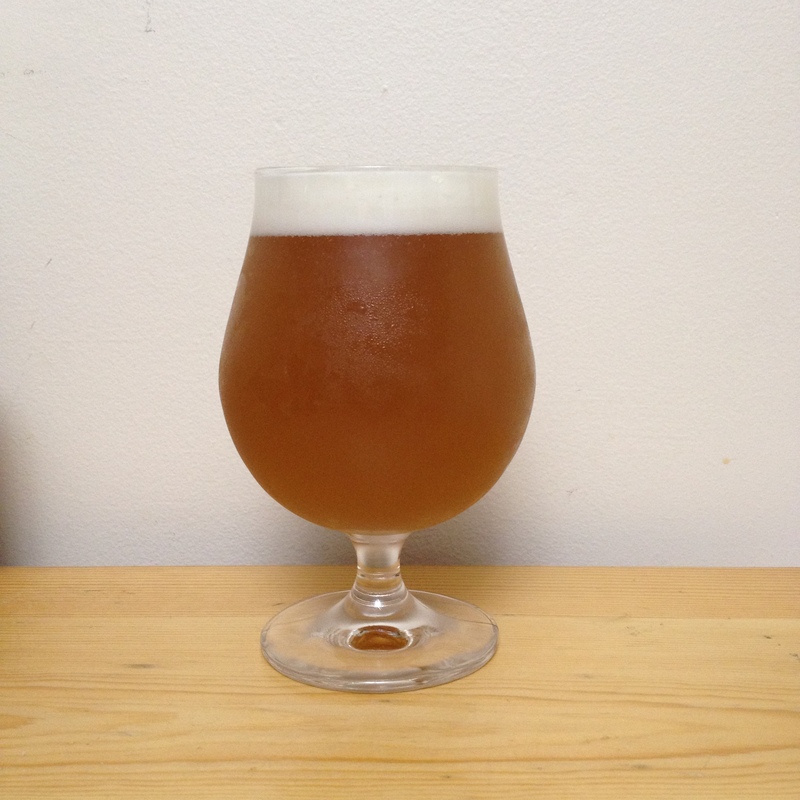 Beer is amber and really hazy (probably chill haze from the rye protein). Nice soft white head of small bubbles, lots of lacing, decent retention. Aroma is nice, could be a little stronger but the pine and chinook blast through. There is a mild bubble gum ester possibly that is the rye coming through, the aroma is nice. Beer is smooth, medium to light in body, not a dry finish. Bitterness on the back end is less than expected but appropriate. There is a lot of nice malt character in this beer that balances well with the hops. There is a lot of hop, pine earthy grassy, character in this beer. It starts out with a small amount of malt character that gives way to a huge amount of hops. There is no aftertaste…seriously a wonderful beer. PHEW! I’ve posted a few bad beers in the past couple of months and I was getting worried I forgot how to make beer. I’m glad that is not the case…Serious. This beer isn’t perfect but if I ordered this at a brewery I’d be pleased. I’ll have no problem drinking this (I’ve been drinking this for the past several days and I’m loving it). I already have a version of this beer in the fermenter with 4 times the rye in the grist bill. Let’s see what happens. It just started dry hopping today but it is likely headed for bottles so an experimental hop saison (remember those?) can go on next. This beer is good, really bitter and has a nice hop range to it. I’m curious how it stack up against a much more rye version of it, hopefully the rye becomes a more dominant player. I’m going to start playing with “hop stands” with my hoppier beers…adding hops to the partially chilled wort rather than right at flameout. I think it could do a lot for the beer flavors and overall bitterness…that’s what I’m researching these days. I’ve already remade this beer but using 20% Rye in the grist to really push it up. Just curious to see if I can tell the difference between the different levels of rye, I assume ahead of time I can but I like rye beer. I have a new Experimental hop beer in the fermenter as well, this beer is #5 of 6 for this year’s experimental hops and I’m already planning out next year’s set of experimental hop saisons…with a few variations. Also, the Kluyveromyces beer that I’ve been toying with is ready to bottle, a pretty long post about that yeast is coming up. Upcoming brew days include a Moteuka Abbey Ale which I’m really excited for. Also, one more experimental hop beer, a Brett b saison with sage, a smoked malt beer and so on and so on….a lot of beer coming up..a lot of writing too. The next post will likely be a rant about Trappist breweries while I get drunk with a friend of mine…that is going to be so much fun. Stay tuned. The 20% rye got stuck, this one was fine but the port on the pot post-boil was clogged (the hop screen was clogged, at least I though so)…but you are correct that I didn’t use rice hulls in either the 5% or the 20% rye beer foolishly.